In March 2011 we bought an ornate snuff box at Bamfords Auction House in Derby. 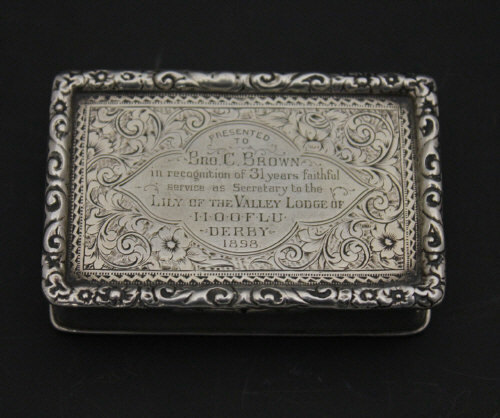 Engraved with flowers and leafy scrolls, the hinged cover is inscribed ‘Presented to Bro C Brown in recognition of 31 years faithful service as Secretary to the Lily of the Valley Lodge of II00FLU Derby 1898′ (Size 7.5cm wide). Although Victorian it shows the progression of high quality metalwork and fashionable goods that began being manufactured in Enlightenment Britain. The snuff box is of particular interest to Derby Museums though owing to its inscription. The ‘Lily of the Valley Lodge’ was in fact a ‘friendly society’ in Derby. Before the welfare state friendly societies provided financial and social services to individuals, often according to their religious or political affiliations. Some friendly societies had ceremonial and friendship purposes also. They are used more commonly today purely as a personal financial service although some still act within ancient orders. Cooperative banking is a good example of an existing friendly society. The maker, Thomas Hayes (working 1890-1892), belonged to a rich history of silversmiths originating from Matthew Boulton (1728-1809) who created the modern silver trade in Birmingham in the 18th Century. His successful campaign to establish a local assay office provided a hallmarking system to guarantee the silver content of locally manufactured items. Boulton’s enterprise and ideas made him a central figure in The Lunar Society alongside Erasmus Darwin and John Whitehurst whose contribution shaped the Industrial Revolution. We believe the inscription ‘IIOOFLU’ to be the abbreviation of ‘Junior Independent Order of Odd Fellows Lodges Union. In Latin inscriptions ‘J’s’ are inscribed as ‘I’s’. At Derby Museum we already have a collection of documents relating to the lodge including committee meeting minutes, annual reports, ledgers etc.